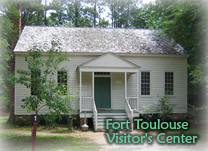 Located inside "The Graves House", a Carolina Tidewater Cottage built around 1830 in Lowndes County Alabama. Interpretive trail from visitors center through forrested section of the park. Includes bridges, decks and primitive trail all the way to the boat ramp.